A letter of intent for employment is sent with your resume to a potential employer. It is the best opportunity to make an initial positive impression and to get your job application and resume read with serious attention. A well written letter of intent will help you to stand out from the crowd by packaging and presenting your experience and skills in a convincing and compelling format. Select the type of letter of intent you are looking for from the samples we provide and adapt it for your specific needs. This type of letter is also referred to as a cover letter, job application letter and resume cover letter. 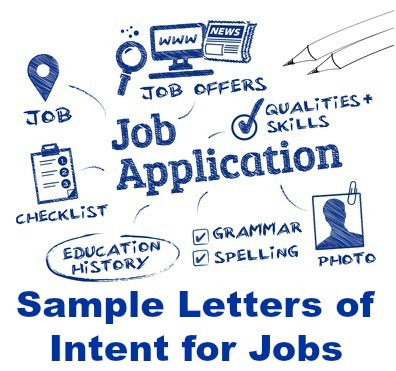 There are a number of different types of letter of intent to send with your job application. Use these cover letter examples when you are submitting your resume or application for a specific job opportunity that has been advertised. These resume cover letters are personalized to highlight your suitability for the specific job opening. A good cover letter gets the reader's attention and persuades the employer to spend time going through your resume. Select from these 50 Sample Cover Letters to help you write your own convincing letter of intent for employment. These are cover letters that are sent with your resume to companies that have not advertised a specific job opportunity. They are basically networking letters to be used in your job search. A large number of job openings are not advertised but are filled by word of mouth. Networking is an effective way to find a job but it can be intimidating. A well written and informative letter of intent is a good starting point. These sample Cover Letters for Employment can be adapted for your own use. Use this type of job application letter when you are submitting your resume online. An email letter of intent must capture the reader's attention straight away and convince him or her of your suitability quickly and compellingly. The subject line and structure of your email letter is all important. This letter of intent can be used as a general cover letter when you are giving your resume to a number of potential employers such as at a job fair. Applying for a job in a different career field can be challenging. This Career Change Cover Letter Sample focuses on your transferable skills and strengths to convince the employer that you are able to do the job. Whether you are moving to a new place or you are considering relocating for a specific job opportunity these Relocation Cover Letters can be customized for your situation. How do you write a good letter of intent for a job? Before sending off your letter check that it meets these criteria. It is essential that your letter of intent and your resume work together to secure the job interview. Use these free resume samples to help you.